With almost every key player back from a 23-win NIT team and two potential impact transfers also available, Rhode Island entered the season as a threat to not only make the NCAA tournament but also capture the Atlantic 10 title. Then the Rams suffered a devastating injury mere minutes into their season opener. An MRI exam taken Saturday revealed that the right knee injury guard E.C. Matthews suffered Friday night will sideline him for the rest of the season. 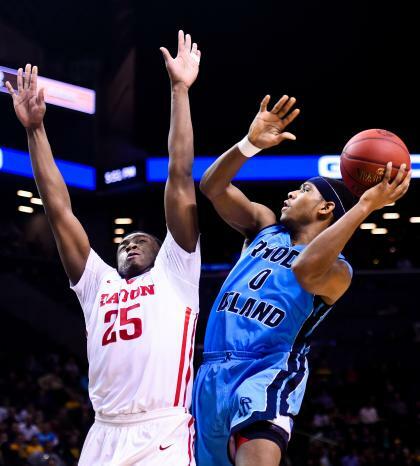 Rhode Island's leading returning sustained the injury in the first half of a 65-42 rout of American University when he drove to the hoop, planted in the paint and crumpled to the floor clutching his right knee. "While the news has been a lot to process in such a short period of time, I know that it is a temporary setback and I will be back stronger and hungrier than ever before," Matthews said in a statement released by the school. "Whether it is a rehab or physical therapy session, I will fight to get better everyday. This is a new challenge and I am up for it." The loss of Matthews means Rhode Island will have to find a way to replicate the 16.9 points per game the 6-foot-5 guard averaged a year ago. No single player can do that by himself, but the Rams do have enough depth to remain a formidable opponent. Guards Jared Terrell and Jarvis Garrett are both returning starters. Sharpshooting Vermont transfer Four McGlynn scored 15 points in his Rhode Island debut on Friday and will likely replace Matthews in the starting five. And forwards Hassan Martin and Kuran Iverson will instantly go from secondary scoring threats to guys counted on to shoulder a bigger load. The only silver lining to the Matthews injury for Rhode Island is that its entire core should be back again next season if there are no defections or early departures. Nonetheless, this is still devastating news for a program whose time had seemed to have arrived.